Philippine's Latest Entertainment News: Manny Pacquiao Won by KO! Manny "Pacman" Pacquiao has made boxing history again by knocking out "Dangerous" David Diaz in the 9th round of their last June 29. That made Manny Pacquiao the first Filipino ever to win in four boxing divisions. He now holds the WBC lightweight championship crown, but other that he also holds the crown for super bantamweight, junior lightweight, and super featherweight championships. He was able to prove to everyone that he's the best pound-for-pound boxer in the world! Woohoo! Filipinos all over the world are Just so damn proud of him. That includes myself. The streets were empty that day, all were in front of their televisions watching The Pacman destroyed Diaz's poor face. Manny was presistent in going after the Mexican early in the first round. And it seemed like Manny's gloves were made of magnets and Diaz's face was made of iron, because no matter how hard Diaz defended himself, Manny's punches always made it through. That's just how fast Manny delivers his punches. The next three rounds definitely belonged to Pacquiao as his speed never wavered in giving Diaz more combinations of jabs and hooks. Quite noticeable was how Pacquiao now effectively used his right hand in dishing out punishment on Diaz's face and body. Round 5 was evident that the beating had taken its toll on Diaz as he involuntarily danced like a drunk. 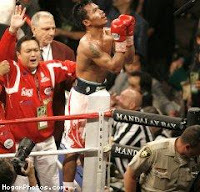 Sa umpisa ng 8th round Manny fired up as he gave Diaz precise right-left-right punches that sent Diaz sagging and dazed! Manny's five-punch combinations would have sent Diaz to sleep but luckily the bell saved him. I wondered how Diaz felt when the bell signaled for round 9. His face was now bloody, he tried to go for offense, but Manny was already after him, giving Diaz a three-punch combination to the head. And then BOOm! Well not yet though, Diaz's left eye began to blacken and close up quickly because of Pacman's solid left. Pacman dished out final jabs, then quickly, a right-left punch that finally sent the ex-champion down face first. The referee then waved the fight off at 2:24 in the 9th. It's over. The Pacman wins by KO!